In the past three days, powerful earthquakes have struck in three different countries across the globe. The latest struck today, April 17 in Tonga with a magnitude of 5.8, according to the U.S. Geological Survey and a report from USA Today . As of 6 a.m. EST on Sunday, there were no reports of deaths or injuries. 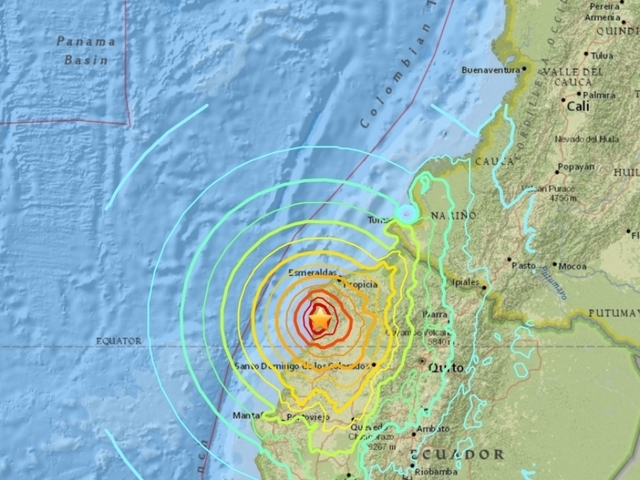 The quake comes on the heels of two other major earthquakes, one in Japan on Friday in which 35 people are dead and 11 are missing, and one in Ecuador on Saturday that killed 233 and injured more than 570 people. In Ecuador, buildings were flattened and highways along its Pacific coast buckled, sending the Andean nation into a state of emergency. As rescue workers rushed in, Ecuador's Vice President Jorge Glas said at least 235 people had died and more than 1,500 were injured. Earlier, President Rafael Correa reported rescuers were struggling to reach survivors trapped in the rubble. Glas said 10,000 armed forces had been deployed to help. In addition, 4,600 national police were sent to towns near the epicenter. Officials said shelters had been set up and field hospitals were being deployed in Pedernales and Portoviejo. More than 3,000 packages of food and nearly 8,000 sleeping kits were being delivered. Electricity in Manabi province, the hardest-hit, remained mostly down as authorities focused on finding survivors. Ecuador's ally, Venezuela, pledged humanitarian aid while neighboring Colombia, where the quake was also felt, said it stands ready to help in any way possible. The government is drawing on $600 million in emergency funding from multilateral banks to rebuild, Correa said.